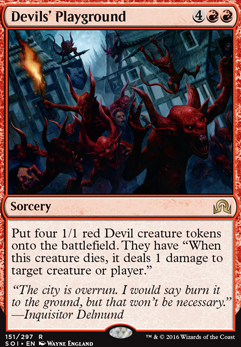 Put four 1/1 red Devil creature tokens onto the battlefield. 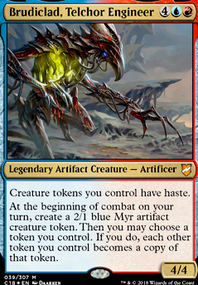 They have "When this creature dies, it deals 1 damage to target creature or player." @DirkPortly I haven't put in the battlements since it doesn't do much in terms of the win-con, but Emrakul's Hatcher is great! I'm considering adding that as a replacement for Devils' Playground since it's the same number of creatures but one less mana to cast. What would you have it replace? OK so the deck glitched out and it didn't work out the way I wanted it to so I will just put in a comment of what I would do/suggestions. 1. You have too many lands. 30-35 lands is what you would look for in a deck. So I would cut down to 35 lands and use those 5 that you cut out to get ramp. 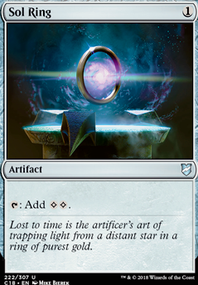 I would put in Sol Ring , Kodama's Reach , Zendikar Resurgent , Commander's Sphere , and Urza's Incubator . 2. I would also get rid of the things that are giving you non-dragon creatures. So I would take out Goblinslide , Devils' Playground , Dragon Fodder , Dance with Devils . This is so that you can use cards like Vanquisher's Banner and Door of Destinies so that you can pump up your dragons and do more damage! 3. You have some creatures that are there just to be there. I would replace all non-dragon creatures other than Dragonmaster Outcast . Dragons that you can use to replace are; Lathliss, Dragon Queen , Savage Ventmaw , Utvara Hellkite , Scourge of Valkas , Hellkite Tyrant , Moonveil Dragon , and Thundermaw Hellkite . 4. Although your dragons can remove creatures you need to be able to deal with enchantment, artifacts, and you also have to protect your dragons as well! So I would remove Draconic Roar , Echoing Courage , Sarkhan's Rage , Savage Alliance , Stonefury , Bathe in Dragonfire , Devour in Flames , Make Mischief , Reduce to Ashes , Sarkhan's Dragonfire , Atarka Monument , Staff of the Flame Magus , Outpost Siege , and Retreat to Kazandu . You already have dragons doing damage when they Enter The Battlefield so I would take out instants or sorceries that are doing that. Plus I recommended taking out some of the ramp that you already had because there is better ramp. 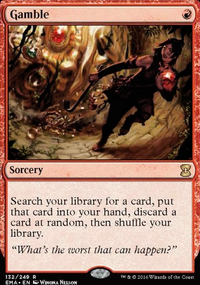 For removal I would suggest Beast Within , Naturalize , Decimate , Hull Breach , and Vandalblast . Now to protect your creatures I would add Heroic Intervention and Asceticism . 5. Last but CERTAINLY not least, MANA! Ok so I know I mentioned going down to 35 but even if you just take away 5 basic lands there are non-basics that I would take out that might fix you down to 35 and then I will give some recommended lands that might help. I would take out Crumbling Vestige , Gruul Turf , Looming Spires , Pinecrest Ridge , Quicksand , and Vivid Crag . I would put in Command Tower , Cinder Glade , Rootbound Crag , Mosswort Bridge , Spinerock Knoll , and Spire Garden . Ok so I know that is a LOT to take in but please take note that I am in no way a professional helper. This is all in my opinion and don't let me influence your playstyle. I am happy to answer questions if I can and I am here to help! If you're going to build a deck as cheap as $30, you're probably going to have to lean on a theme to make it functional. That can be supplemented with the fact that even mediocre demons and devils are good at not being coin-flipped away, but stuff like Dance with Devils wasn't even playable in Limited. I see some reanimator stuff going on, so if you go that route, Torrent of Souls , Zombify , and Profane Command are all solid budget options. You'll want some graveyard stocking power to go with it. Mindwrack Demon , Extractor Demon , Archfiend of Ifnir , pull double duty. Cathartic Reunion , Dark Deal , Faithless Looting , Hazoret's Monument , Khorvath's Fury , Collective Defiance , Shattered Perception , and Tormenting Voice all fit the bill. 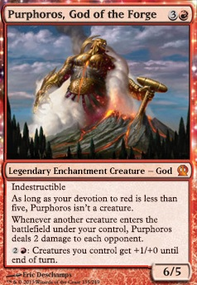 Also, Flayer of the Hatebound could power a nice subtheme with your reanimation, and you can stock up on cheap Undying creatures like Demonlord of Ashmouth , Hound of Griselbrand , and Pyreheart Wolf to lower your budget and synergize with Rakdos. Charmbreaker Devils could also be a house once you stock the yard. 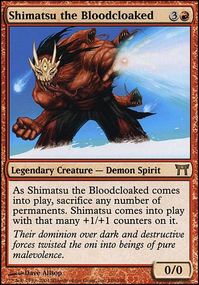 Also, maybe improve general card quality by splurging on Bloodgift Demon and Demon of Wailing Agonies ? Demon's Horn , Carnage Altar , Rakdos Riteknife , Devils' Playground , Dance with Devils , Consume the Meek , and Rite of Belzenlok , Archdemon of Greed , Temple of the False God , Tomb of Urami , and Kindly Stranger Flip are all pretty bad. Akoum Refuge and Bloodfell Caves seem like easy adds, as well.